Cover Letters make a big difference determining whether your resume goes into the trash can or lands in the “call for phone interview” pile. Jim Kukral, in a recent blog article mentioned he was reading an article in the June 2010 issue of Inc. Magazine where Jason Fried, the founder of 37 Signals – a popular software company, talked about their screening criteria. I also saw the article, but thought I would give Jim the credit since he’s the first I’ve seen mention it. Jason mentioned that the company first looks to the cover letter that tells a story about the person much better than the traditional resume. Take a moment or two and read the whole article. More and more hiring managers are focusing on the importance of the cover letter. This is a must read article RECONFIRMING what we’ve been saying all along that you’ve got to include a cover letter with your resume to GRAB the attention of a recruiter, HR pro, or hiring manager. 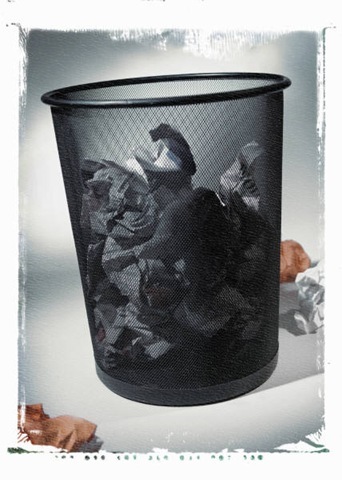 Sending resumes without cover letters or using a standard form will net you the trash can. Don’t be a trash can magnet. Does anybody read or care about cover letters? You can even download a FREE sample cover letter by clicking here. This has been one of our most popular downloads. We provide a step-by-step cover letter tutorial in our job search workbook “This is NOT the Position I Accepted.” Discover how to construct a powerful cover letter that increases your selection for job interviews by 30%, 40%, or 50%. Fifth Step is an invitation to a face-to-face interview. How to interview is IRRELEVANT if you never captured their attention in the first place with your cover letter. You can download the FREE Chapter on Phone Interviewing by clicking here. P.S. Don’t forget to join our LinkedIn Job Search Discussion Group which is rapidly becoming one of the most vibrant and dynamic job search forums on the Internet. Job Search Success: Can Targeting Make a Difference? Don’t even think about trying this technique unless you’re prepared for an employer to offer you a job. I was speaking with a client a few days ago and he told me a story about a candidate he had just hired for a sales position. She had lost her job at a company who was not a direct competitor, but was providing services at a different distribution level in a tangential industry. (I amaze myself sometimes with my ambiguity). She had sent her resume to the CEO requesting an interview. He blew her off – wrong skill set – wrong industry – wrong level in the distribution/supply chain. And to top it off – he didn’t have a current opening. She was persistent. She began an aggressive campaign of sending him letters detailing why he needed to hire her in his sales department. She had conducted extensive research on the company, talked with their suppliers, talked with their customers, and found people within the company (using LinkedIn of course). She described in “precise” detail the problems she perceived, the steps that needed to be taken, and where she could help to resolve those problems. Over the course of a few interviews, she became more and more specific about how she could make a difference – through fact-finding in the interviewing, she collected great information. The company was still undecided (hard to believe). Finally, she sealed the deal by preparing a plan of action of what she would do in her first 90 days. She convinced the company to allow her to present her plan at a meeting. Upon hearing exactly how she would translate her prior experience into actionable steps in this new company, they hired her. That’s how targeted job search works. What’s the alternative? The alternative is the shotgun scatter method to job search used by many job seekers. Under the shotgun scatter model, you send out hundreds of standard cover letters and resumes to every company that remotely includes a keyword of interest in their ads. 99.99% of these end up in the trash can. You just wasted 20 hours of your week responding to job ads for which you had no chance of ever making it to the stage of an interview. Wouldn’t your time be spent more productively targeting jobs, opportunities, and companies – rather than wasting time on the shotgun scatter model of job search? Discover if you’re job search is effective by downloading our FREE Job Search Plan Self-Assessment. Discover if you’ve got all the elements in place to target the perfect job. The debate rages on about using cover letters. Do I need one? What is the best format? What should be in it? Who do I address it to? How long should it be? And on, and on, and on. I have asked many of my clients and other recruiters about their feelings on cover letters. For the most part with hiring managers and HR it is mixed. Some want them and others don’t care one way or the other. However, with recruiters there seems to be a more uniform consensus that recruiters don’t pay much attention to them. Given this I recommend when sending a resume directly to a company, hiring manager or HR to include a cover letter. When responding to a recruiter it isn’t that important, but if you have one ready go ahead and include it. Only don’t send it as a separate document, include in the same file as the resume. The biggest problem with cover letters is the attempt to make them an addendum to one’s resume. Meaning that candidates often use the cover letter to add points that aren’t included in their resume, rather than re-writing the resume. This is completely WRONG. If the points are important enough to be in the letter, then they must be included on the resume. The primary reason for a cover letter should be to present such a compelling case that the person reading it will get excited enough to take the time to actually read your resume. There is nothing more frustrating than to get all excited about a candidate from the cover letter, only to have the rug pulled out from this excitement when the resume doesn’t include any of these points. The reader is left wondering, where did these take place, how long ago, if they really did happen and they are that significant why aren’t they on the resume, guess the candidate didn’t think they were all that significant so as to re-write the resume, etc? As you can see it creates more questions than it answers. It is critical you take the time and make the effort to re-write your resume with this information included. Don’t just send out the generic resume. If the cover letter gets separated from the resume you want to make sure the resume stands by itself. You can download an example of a cover the we recommend using. This format has proven very successful. To get your FREE example CLICK HERE. For more information on cover letters and resumes take a look at our “Complete Job Search Home Study Course.” We will send it to you so you can review it completely for just $14.95. Plus we will even pay the shipping to you and include a copy of our best selling book on your job search. To learn more CLICK HERE. 5 proven steps to finding a job in a recession! Is Checking References Worth the Effort? Should We Use Assessments In Our Hiring Process? Should I Let Employers Think I am Still Working? How Important are Recruiters in a Job Search? How Can I Improve How I Interview Over the Phone? Is Your Job Search Stuck in High School Time Warp?